Ve aquí las instrucciones en español. How is the extension used? All you have to do is open the extension when you are on a page whose URL you want to shorten. If you want to shorten an address that is in the body of a web you can select it, use the right mouse button and click on the icon URL MultiShortener that you will find in the context menu of the browser that will be displayed. There are several tabs for ordering the shorteners. The first and that is the one shown when opening the extension is the for your favorite shorteners. You can add and remove shorteners from this list by right-clicking on the shortcut icon / button. The second tab, CPM, incorporates all the shorteners that base their pay on the visits received. Then Direct hosts shorteners that don't pay for visits but can be useful, despite its name here you will find shorteners that send visitors directly to the landing page and others that use intermediate pages. Lastly, the CPA tab contains shorteners with which we can earn money for the actions that the user performs, either in the landing pages or in the intermediate ones. When you have chosen a shortener, all you have to do is click on it. If you already have the credentials entered or you do not need them, you will be notified of obtaining the shortened link, which will become available on your clipboard. To use it, paste it anywhere, either through the menu of your browser / operating system, or through Control + V, if you are in Windows or Linux. How to insert the credentials? When we use a shortener that requires credentials to access your API, it will be necessary to pick them up from their site and insert them into the extension. These credentials generally only serve to shorten links, so the security of your account will never be compromised, if not disclosed further. Each shortener may require a number of different credentials. Some just need your name, others a key and others a set of them. You can always find the instructions to get these credentials in the panel that will be displayed when the load is finished on the main page of the shortener. Each shortener uses a different method so following the instructions and understanding them to know which parameters to enter is very important, otherwise the API will not work, and we will not get any short link. Once you have the credentials, you have them inserted and saved with the Save Settings button, you will always have them available and you will not need to enter them any more, log in, or visit the shorter website for short links. How to delete / edit credentials? Delete the credentials from the context menu of the browser. Opening the extension, click with the secondary mouse button to display the contextual menu and click on the option. From configuration. The extension has a complete panel to review and edit the credentials. Right-click on the extension icon and select the Settings option. You can also retrieve the credentials if you are using them on another Chrome device, using the Push to and Pull from cloud buttons that you will find in the same section, settings. 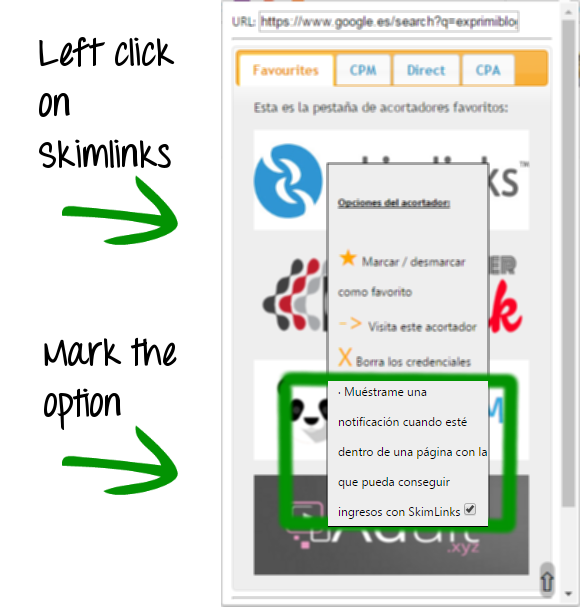 How does the SkimLinks shorter work? The SkimLinks shortener (you need to have a web to create an account) does not show any intermediate pages. Revenue comes from commissions for sales on landing pages. Your links are only useful when they point to one of the advertiser pages available on it. Fortunately, it is also very easy to know on which pages you can use this shortener for income. 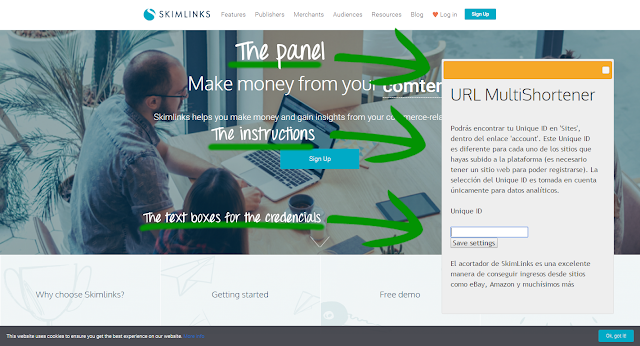 Simply locate the button of SkimLinks, right-click on it and check the option to display a notification when you are inside a page with which you can earn income from it. How to add other shorteners? Go to the CPA tab once the extension is open. Click on the button "Your custom API endpoint" and enter the credentials in the panel that will appear. At the moment, these credentials can only be a complete endpoint API address without any URL example or other parameter to replace. In addition, this parameter for the URL must go to the end and only GET requests are allowed. If you have any questions, suggestions or any other comments, do not hesitate to contact me by whatever means is most convenient.